In my last blog post, I wrote about a recent photo discovery made of an old photo gallery built and owned by my great grandfather, John Arthur Kephart. 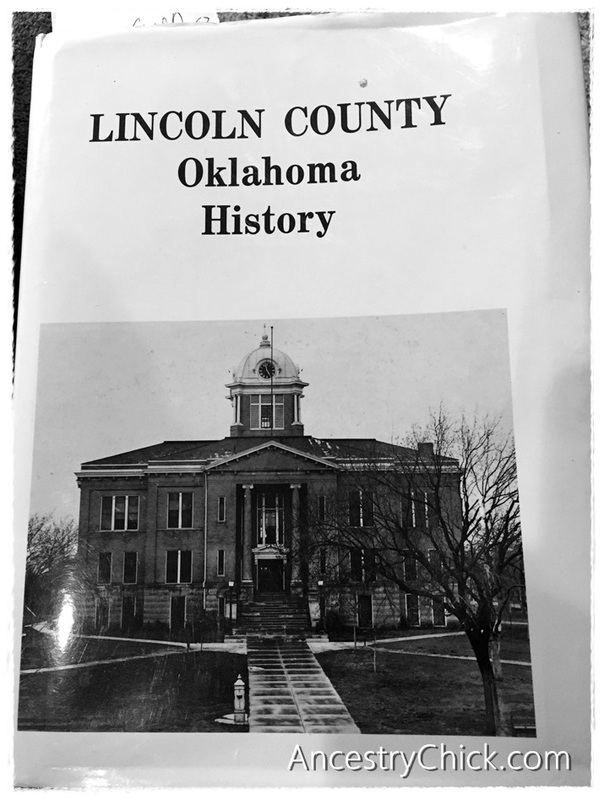 It was so great to get that from the kind researcher at the Lincoln County Historical Society in Chandler, Oklahoma. 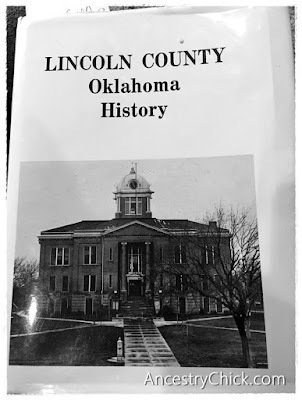 So I asked her what book she found the photo in, and she told me it was from the Society's history book of the county, called Lincoln County Oklahoma History. That book is no longer in print, but I found a copy on Ebay--all 1,572 pages of it. I have so many ancestors from Lincoln County, I knew I had to have, so I'm glad I won that auction! Believe me when I say that I've not yet read this beast of a book. I'm skimming and scanning my way through slowly. But I did check the index straight away to check for ancestor names, and they were there! 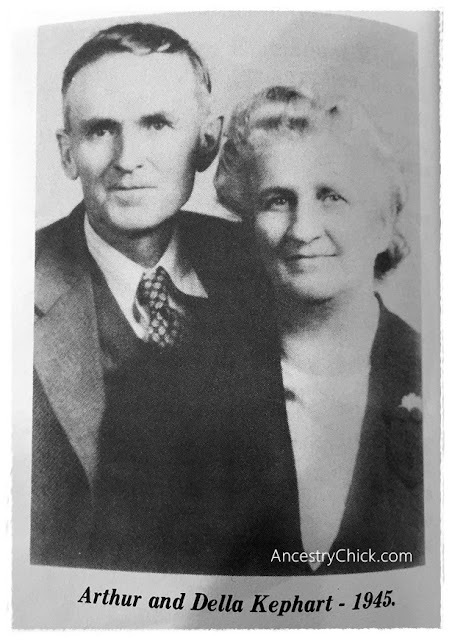 In particular, I have found a couple of great photos and articles, both written by my great aunt, Ruby Christina (Kephart) Stephens, who is my namesake. Much of the content of the book about various local families was written by living family members, who I'm sure also provided many photos. I so love the photos! Yay! The photo below is of my great, great grandmother, Susan Eleanor (Templeton) Kephart. Next to her is her granddaughter, my great aunt Ruby, when she was a young girl. 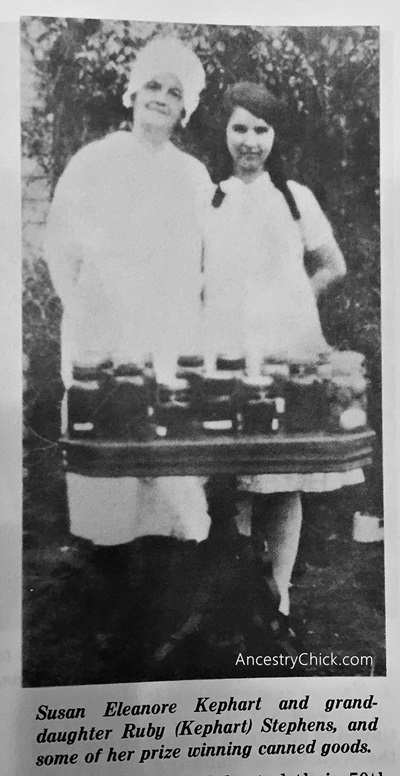 Nellie (as Susan was often called) was a prize-winning gardener and canner, among many other things. So I love that this photo in the book shows her with some of her canned goods. This next photo from the book is of my maternal great grandparents, Della Mae (Swinford) Kephart, and John Arthur Kephart. Until I saw this photograph in the book, I had forgotten that I had seen a real one many times before--in my grandparents' home. As soon as I saw it I could picture it hanging on Nana's wall. I love that photo of them! I only wish I had a real copy of the photo myself. But this one is better than nothing, and it sure was nice to find it in the book. And since my great grandfather was a photographer back in the day, and one of the only ones in Lincoln County for quite awhile, he is credited for taking some of the photos in the history book as well. As I go through the book I am bookmarking pages and making notes, and I hope to share more information from it here on the blog in the future. I have some other Swinford ancestors in the book as well. So who knows what else I may find. I wish every county had books like this. It really is a wonderful way to travel back in time and visit the places so many of my ancestors lived. 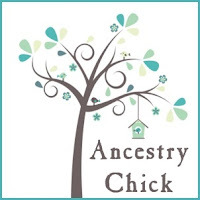 What a treasure for a genealogist like me!